Who doesn’t want high returns on their investments? However, when something sounds too good to be true, it probably is. More specifically, when certain stocks deliver excellent returns, ask yourself what’s the risk behind them. Shopify (TSX:SHOP)(NYSE:SHOP) has got to be one of the highest return tech stocks out there. Here’s a chart that shows its total returns since inception compared to other big tech names. 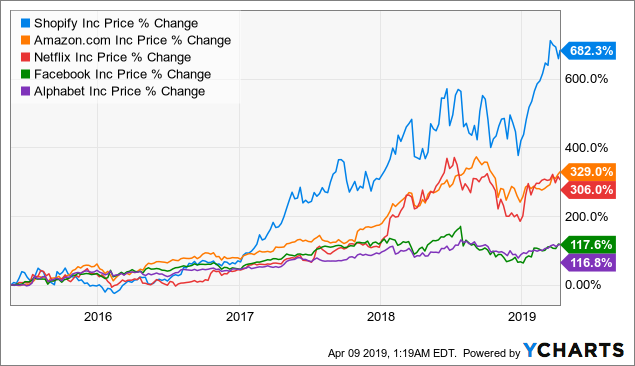 Yes, Shopify stock kicked the butts of the FANG stocks, Facebook (NASDAQ:FB), Amazon (NASDAQ:AMZN), Netflix (NASDAQ:NFLX), and Alphabet (NASDAQ:GOOGL)(NASDAQ:GOOG). However, Shopify’s valuation is super duper expensive. At about US$200 per share, it trades at a blended P/E of about 500 and a PEG ratio of about 20. Alphabet’s P/E of about 27.3 and a PEG ratio of 1.5-1.9 at US$1208 per share for GOOGL. Surely, Shopify is growing at a super fast rate. For example, revenue growth was 59% in 2018. However, because of its astronomical valuation, it’s especially subject to an especially huge drawdown when we experience a market meltdown. By the way, I don’t categorize the little correction we had from October to December 2018 as a market meltdown. In that period, Shopify fell from a high of about US$168 to a low of about US$120 for a drop of 28%. Imagine what a real market meltdown can do to Shopify stock (at least in the short term). Biotech stocks did very well for a long time. The long-term price chart of iShares NASDAQ Biotechnology Index (NASDAQ:IBB) illustrates the big picture. This entry was posted in Growth Investing, Investing and tagged NASDAQ:AMGN, NASDAQ:AMZN, NASDAQ:FB, NASDAQ:GOOG, NASDAQ:GOOGL, NASDAQ:IBB, NASDAQ:NFLX, NYSE:SHOP, TSX:SHOP on April 8, 2019 by Passive Income Earner.